Herb Stott had an office down the hall from me and I really didn't know him that well. I was just a newbie and Herbie had already worked at Disney a few years. Because of that, we considered him a veteran. In reality, Herbie was just another young kid with big ideas and ambition. Initially, we thought Herb was an animator because he had an office all to himself. Usually, a private office was a perk only enjoyed by animators. Eventually we found out that Herb was only an assistant animator although he did have a Movieola in his office and that alone was considered quite a prize. We were impressed by Herbie's swagger and confidence. He may not have been a Disney big shot but he sure acted like one. This should have been a clear sign that Herb Stott was not just another faceless Disney assistant. The years flew past and by the seventies I had finally attained the coveted title of animator. Unfortunately, this was not at Disney where I had been given the royal boot by the troubled, transitioning animation department. No matter. I found a fair share of work at outside studios and the best paying gigs were usually at commercial houses where I found the work more exciting than the usual Saturday Morning dreck. One late Friday afternoon I made my way to a small production house located on the Sunset Strip out in Beverly Hills. The Spungbuggy Works produced animation and live-action television commercials and at the time they were a pretty big deal. Now a full fledged animator, I stopped in to pick up an animation assignment. I would be animating a dancing cartoon cricket. The pocket cigarette lighter was made by the client, Gillette. 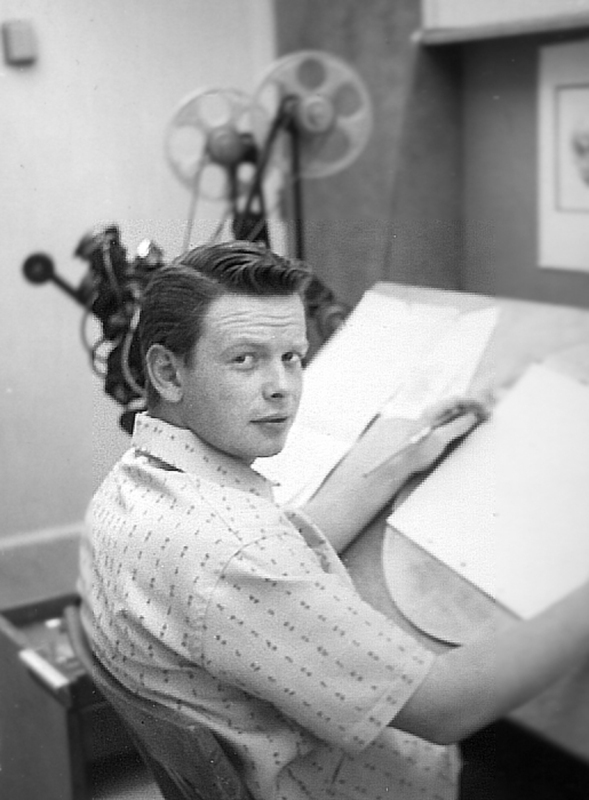 However, the bigger surprise was suddenly discovering that the studio was co-founded and managed by none other than my old Disney pal, Herbie Stott. It had been nearly twenty years since I last saw my old colleague in the hallway of Walt's Animation Building. Now, here he was running his own studio and working in the big time. Sadly, I had no real interaction with my former Disney colleague. As usual, I was working away on a series of animated television commercials while Herbie seemed more focused on live-action. For some odd reason, shooting actors on a sound stage has always been more “glamorous” than working at a drawing board. In any case, I enjoyed my time at The Spungbuggy Works. I never had a problem with “the boss,” and he was an okay guy to work for. However, I still remember the photograph I snapped of Herbie Stott many years ago. Looking back from his Disney drawing board and secretly planning to one day run his own company. You can see it in his eyes, can't you? June 27, 2013 by Floyd Norman.